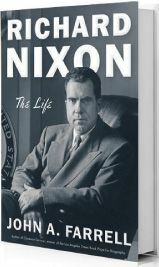 Farrell “understands all too well that Nixon was a vat of contradictions,” said Jennifer Senior in The New York Times. Born the insecure son of a failed Yorba Linda, Calif., rancher, the Nixon we meet here initially engenders sympathy: His love letters to Pat, his future wife, are both “endearing and pathetic”—“the desperate pleas of the runt of the litter.” Early on, he also made surprising alliances, said Robert Landers in The Wall Street Journal. As a young congressman, Nixon was good friends with House mate John F. Kennedy, close enough that in 1954 he tearfully prayed that Kennedy not die during a risky surgery. That relationship changed, of course, and Farrell pinpoints Nixon’s loss to Kennedy in 1960’s presidential election as the experience that soured the Californian for good.